• For rapid, quantitative, bioluminescent determination of ATP and evaluation of drug effects on ATP metabolism. • Robust and amenable to HTS: Z factors of > 0.5 are routinely observed in 96-well and 384-well plates. Can be readily automated on HTS liquid handling systems. • Adenosine 5’-triphosphate (ATP) is the chemical energy for cellular metabolism and is often referred to as ?energy currency" of the cell. ATP is produced only in living cells during photosynthesis and cellular respiration and consumed in cellular processes including biosynthetic reactions, motility and cell division. It is a key indicator of cellular activity and has been utilized as a measure of cell viability and cytotoxicity in research and drug discovery. BioAssay Systems? 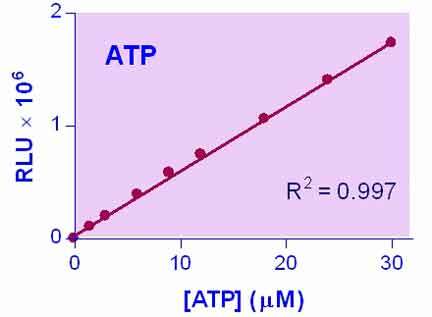 EnzyLight™ ATP Assay Kit provides a rapid method to measure intracellular ATP. The single working reagent lyses cells to release ATP, which, in the presence of luciferase, immediately reacts with the Substrate D-luciferin to produce light. The light intensity is a direct measure of intracellular ATP concentration. This non-radioactive, homogeneous cell-based assay is performed in microplates. The reagent is compatible with all liquid handling systems for high-throughput screening applications in 96-well and 384-well plates. 1. Can this kit be used to adhesive cells? This kit is suitable for adherent cells. The assay buffer contains 0.5 % Triton X-100 that will efficiently lyse the cells. 2. Is the lysis buffer in the kit suitable for Bradford protein assay? The final Triton X-100 concentration in the lysate will be around 0.25 % which would interfere with the Bradford assay. Therefore, I would recommend diluting the lysate further. The commonly used BCA assay is not compatible, because of the high amount of mercaptoethanol in the assay buffer (70 mM). 4. Belleannee C, et al (2010). Role of purinergic signaling pathways in V-ATPase recruitment to apical membrane of acidifying epididymal clear cells. Am J Physiol Cell Physiol. 298(4):C817-30. Assay: tube in rat (Pubmed).